Here we present fragments of hand-writing and notation by our composers, which have been animated and made into a 'signatures film'. The composers were simply asked to do a tiny example of musical notation, sign their name, create an aAmplify sign and do a free graphic. The examples are interesting not only for how the composers wrote, but for what they decided to write. The hand-written material has been transformed, using techniques from film animation to make the graphics come alive to samples of the composers' music. 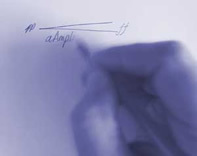 In the composers' own project areas the handwriting appears in its original form. We place a degree of importance on handwriting, because so much of composing has to do with graphically notating ideas. Composers spend much of their life drawing tiny symbols on large pieces of lined paper.